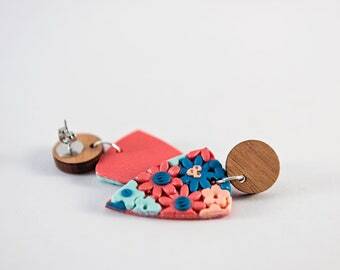 Colourful floral jewellery made with love in Tasmania. Announcement Free standard shipping with tracking within Australia when you purchase $79 or more. Flat rate postage on all other orders! Free standard shipping with tracking within Australia when you purchase $79 or more. Flat rate postage on all other orders! Exquisite, intricate detail. Love all my work from this maker - highly highly recommend. 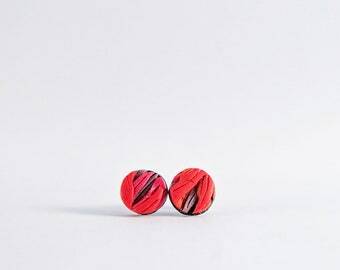 This pair in particular is fabulous when worn as it moves freely. Once again my order was awesome! As a former Tassie girl, it's so lovely to be able to wear a piece of home in my ears. 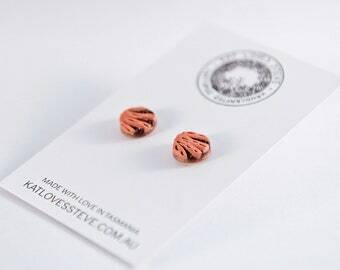 I absolutely love these little Tassie devil studs! Forest floor is the latest of Autumn inspiration for the Southern Hemisphere! This is how all the jewellery starts out... I generally have a pattern in mind, but it is often rearranged once I sit down at the tablet and start arranging and mixing clays. There is only one standard colour in this palate, every other tone is custom! Me - This is me... As taken by my youngest son. Drawing - The inspiration for designs and details. I am a wife (to Steve), a mum, and a bit of a creative misfit. We live way out in the country, and I'd not have it any other way, the peace gives me time to think, to draw ideas in my mind, and then to spend hours researching how to make them become reality! Yep, inside this head is a jumbled and colourful kaleidoscope of designs and dreams. Steve is the love of my life. We have been married since 2001, and have 2 sons, and dozens of animals. After having our children, I never returned to full time work, choosing instead to run my own business, which my hubby joined me in. For 6 years we were wedding photographers and had a wonderful time doing that! In 2015 we had to regretfully close our business due after I had a bad car accident and damaged my neck and back. Just because my focus changed didnt mean my love of creative beauty did. I turned to sketching and then more recently the designs moved from paper, to polymer clay! Earrings are my go to accessory, I often find myself going out without any make up, running my fingers through my hair instead of a brush, and wearing the "boring" old clothes I wore the last time I went out. But I always feel okay if I've got something pretty in my ears, and why not?!! 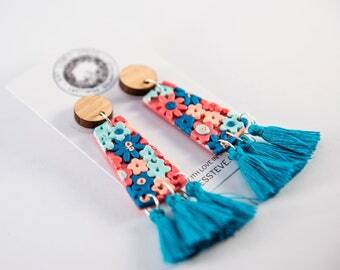 Beauty has little to do with what we look like, but how we feel inside, and a fabulous pair of earrings always fits! So here we go, this is how Kat Loves Steve was created! 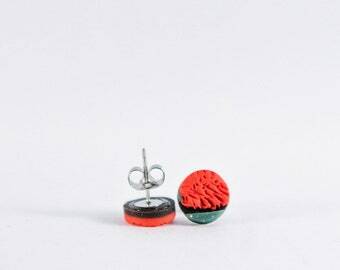 A love of creating things equalled a lot of fun and funky jewellery. I hope you love what I make, and add a little piece of colour into your life too! Wife, Mum, Love of Steve's life! Avid adorer of all types of critters & flowers! 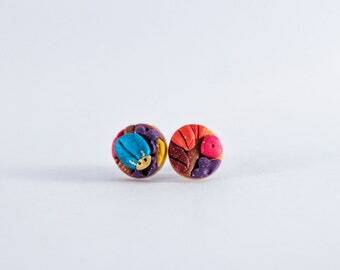 Maker of fun, feminine, colourful, lightweight floral jewellery made with Polymer Clay & LOVE! Husband, Father, Love of Kat's life! Business assistant, dispatch manager, trouble shooter, technical assistant, photographer, and emotional support! No, sorry. At this stage I am no longer doing custom or personalised orders. If there is a colour-way that you would really love though, please drop me a line and I may be able to create something special with that in mind! Approximate sizing of all items is in the listing, these may vary by a millimeter or so due to the handmade nature of the items. Most items show the jewellery displayed on a life sized drawing of a ladies head to give you a better image of how they will hang. Due to hygiene reasons, earrings are not displayed on a human model (unless they own them and have shared a photo). Due to hygienic reasons, I do not accept returns. However if you have an issue with an item, please contact me! I will certainly do my best to fix any problems so you have a great experience shopping with me. All orders are posted in a recyclable cardboard box with Oxy-BioDegradable bubble wrap and tissue paper for protection. We use protective plastic sleeves for your jewellery which can be reused to keep your earrings looking great after wear too. We don’t print a packaging slip for orders as they are emailed automatically by Etsy. You get free standard postage on all orders over $79! YAY! All delivery pricing is a flat rate. So you only pay for the first item, regardless of how many you order. We hope this helps make shopping a pleasure for you! All parcels are sent through Australia Post, and a tracking number will be provided so that you can follow your items journey to your door. Please note that times listed are calculated by Etsy and do not necessarily reflect Australia Posts time frame for delivering your items. If you must have it by a certain date we recommend upgrading to Express Shipping. If you earrings get a bit dirty, you can clean them by gently wiping them with a baby wipe or microfiber cloth (like you clean your glasses with). 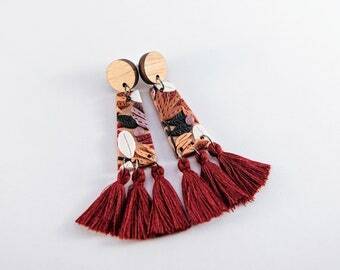 If you have earrings that have tassels on them, you can dampen your fingers and gently smooth down any kinks in the fibers. Rubbing up against other jewellery may cause scratches and chips, or worse yet, even breakages! Please take care of your Loves by storing them separately when you aren’t wearing them, or by putting them on a jewellery board. 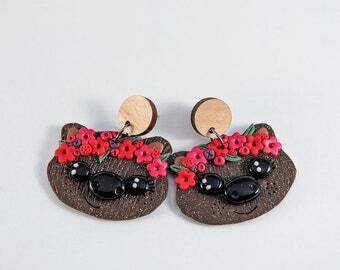 Polymer clay is beautiful, but can be delicate. Please be careful not to drop, crush, or bend your items, they may crack or break. Please don’t leave your jewellery on when you swim, or shower. Water will make its way in to the glue that holds your earrings together and can weaken the bond causing them to fall apart. Also it is best to remove your earrings before applying deodorants, perfumes, sunscreen, or other sprays, or before going to sleep, and please don’t leave them in a hot car.